Three weeks have passed since Trump’s tweet that Obama wiretapped Trump Tower. He has yet to offer any evidence, or apologize. As Week 19 opened, Trump’s Gallup daily approval rating hit a new low: 37% approve, 58% disapprove. New York AG Eric Schneiderman hired a prosecutor who worked under fired US Attorney Preet Bharara to focus on issues specifically related to the Trump regime. An op-ed penned by two former chief WH ethics lawyers titled, “Trump’s unprecedented war on ethics,” detailed a long laundry list of ethics breaches already committed by Trump and his regime. Continuing the Deep State theme, the Trump regime installed insiders in executive branch agencies to spy on fellow employees. At the same time, leadership roles remain largely unfilled (61 of 553 have a nominee). Politico reported that Federal career staffers are living in fear of being targeted and singled out by Breitbart conservative media outlets for not being loyal to Trump. At the first day of the House Intel Committee’s hearing into Russia, Comey said the FBI is conducting a counterintelligence investigation of both Russian interference in our election, and whether there was any coordination between the Trump campaign and Russia. Comey also said there is “no information” to back Trump’s wiretapping claim. During the hearing, Trump live-tweeted from the @POTUS Twitter account. His tweets contained false and misleading information. When asked by Rep. Jim Himes during the hearing, Comey refuted and corrected information in Trump’s tweets. AP fact checked Trump’s tweets vs. what was actually said in testimony. McClatchy reported that the FBI is also investigating the role of conservative media outlets like Breitbart and InfoWars in the Russian hacking of our election. Ivanka got a West Wing office and was granted security clearance, but did not get a formal government role or title. Government watchdogs called on Trump to give Ivanka an official title to avoid conflicts of interest between her government roles and financial interests. Modern Appealing Clothing filed a class action suit against Ivanka’s brand over “unfair competition,” citing Trump and Conway’s publicity. As Trump’s bad week continued, the WSJ reported Kushner’s sale of 666 Fifth Avenue to a Chinese buyer for a $400 million profit, was teetering. Trump hotel in DC will host an event on American-Turkey relations, sponsored by an organization whose chair is a Turkish businessman with ties to the Turkish government. Four Seasons had previously hosted. James Woolsey said while on the Trump transition team he attended a September meeting in which Flynn discussed how to get Fethullah Gulen to Turkey without going through the US extradition legal process. The Trump Organization is pursuing a hotel deal in Dallas with a man known as “Turkish Trump,” whose real estate company has business ties in Russia, Kazakhstan and at least two dozen other countries. NBC reported that The Trump Organization is in violation of New York City law for not being registered with the New York City Department of Housing Preservation & Development. Maddow reported that Sen. Chris Van Hollen asked Sessions to recuse himself from the US investigation of Deutsche Bank, formerly conducted by US attorney Bharara, and asked if this is why Bharara was fired. The Trump Organization launched a new hotel chain, triggering all sorts of ethics concerns, including that investors may invest in order to gain favor and access to the new administration. In the Trump regime’s second major email scandal — Tillerson’s use of an alias email account (Wayne Tracker) — Exxon claimed to have lost all emails from the alias account. Trump’s newly appointed General Services Administration head said his Trump DC Hotel lease is valid. An expert on government procurement law at GWU called the GSA decision harmful to the “integrity — and thus credibility — of GSA. Hawaii’s Rep. Beth Fukumoto resigned from the GOP and said she would become a Democrat. Her open letter cited Trump “marginalizing and condemning minorities” and demeaning women. AP reported a bombshell: former Trump campaign manager Manafort was under a $10 million/year contract with a Russia-related entity, starting in 2006, to covertly promote the interests of the Russian government. The WH responded that Trump was not aware of Manafort’s work for Russian billionaire while Manafort worked on Trump’s campaign. Manafort is also being investigated for transactions with banks in Cyprus, known as a haven for laundering money for Russian billionaires. Wilbur Ross was previously Vice-Chair of Bank of Cyprus. Maddow reported that the Attorney General of Cyprus is cooperating with US officials in turning over information related to Manafort. Five Democratic Senators sent a letter to Wilbur Ross asking for clarification about his ties to Bank of Cyprus. The response was due March 24th, but as of now, Ross has not responded. A Ukrainian lawmaker released documents which show that Manafort laundered payments from former Ukrainian President Yanukovych, who has been hiding in Russia since his overthrow. CNN reported that the FBI has information that members of the Trump regime possibly coordinated with Russia on the release of information damaging to Hillary Clinton. Tillerson gave a surprisingly frank interview to IJR, saying “I didn’t want this job. I didn’t seek this job. My wife told me I’m supposed to do this.” Tillerson said he had planned to retire in March to spend time with his grandkids. On Thursday, House Intel Committee ranking Democrat Adam Schiff said he has been presented new evidence on collusion between the Trump regime and Russia that merited a grand jury investigation. Russian lawyer Nikolai Gorokhov, who represents the family of Magnitsky, a Russian lawyer who died in prison in 2009 after uncovering massive fraud, mysteriously “fell” from his fourth floor apartment, the night before he was set to appear in court in Moscow. He survived. Gorokhov was also scheduled to be a witness in a US case connected to the largest money-laundering scheme in Russian history, USA v. Prevezon, which was on the brink of going to trial in Manhattan. Fired US Attorney Bharara had been spearheading the case. Two days later, former Russian parliamentarian Voronenkov, who fled Russia after criticizing Putin, was assassinated on the streets of Ukraine’s capital. Voronenkov was said to be a key witness in Ukraine’s investigation of Yanukovych and Russian military involvement. Wednesday, offering no evidence, Rep. Devin Nunes held an impromptu press conference where he claimed that some Trump transition team, including Trump, had been inadvertently surveilled. Nunes bypassed protocol of reporting his findings to the House Intel Committee, instead briefing Ryan and then the WH before his press conference, even while the WH is under investigation by the FBI. On Thursday, Nunes apologized to the members of the Intel Committee for not going to them first, and said he was unsure if the Trump regime were even in the phone calls and other communication he cited. Thursday night on Hannity, in explaining his actions, Nunes said he felt a “duty and obligation” to Trump. On Friday, Nunes backed down from his assertion that Trump was surveilled. He also refused to reveal his sources. On Friday, Nunes abruptly canceled an open hearing scheduled for Tuesday, in which DNI director Clapper, former CIA Director John Brennan, and former Acting AG Yates were scheduled to testify. The Daily Beast reported that Tuesday, the night before his Trump surveillance claim, Nunes left a Uber car with a senior staffer to take a phone call, and then mysteriously disappeared for hours. WAPO Editorial Board called for Nunes to be removed as Chair of the House Intel Committee, and investigated for leaking. As the week closed, a Quinnipiac poll found that 66% of Americans want an independent commission to investigate Trump-Russia ties. The House Oversight Committee requested documents from the WH and FBI on any communications between Flynn and Russia. The Senate Intelligence Committee asked Trump adviser Stone to preserve any Russian-related documents. The RNC, while chaired by Priebus, hired a firm with intelligence connections to Russia to dig up dirt on Hillary Clinton. Andrea Mitchell reported on her show that a single source had told her Trump transition team members are purging their phones. A Russian organized crime money-laundering network, with offices in Trump Tower three floors below Trump’s penthouse, was under a court-approved wiretap by the FBI. The investigation led to the indictment of 30 people, including a Russian mafia boss. WSJ Editorial Board issued a blistering attack on Trump — “A President’s Credibility” in which they described how Trump’s constant lies and falsehoods were eroding public trust, abroad and at home. Canada’s largest school district canceled travel to the US, citing worries about Trump’s Muslim ban. Organizers of a Cinco de Mayo festival in Philadelphia canceled, fearing an ICE raid. The festival had been a Mexican folk tradition since 2006. Trump continued to take credit for jobs he didn’t create, this time 20,000 jobs at Charter Communications announced last October. The federal judge in Hawaii who ruled against Trump’s second Muslim ban has received multiple death threats, and is under 24-hour protection. Despite a 44 seat advantage in the House, Trump first major legislative attempt, to repeal and replace Obamacare, failed — a sign of incompetence, but also his weakened political capital amidst Russian allegations and record low favorability. NYT reported that Ryan had told Trump he didn’t have the votes, but Trump, Bannon, and Marc Short wanted to force a public vote to create a GOP enemies list. Ryan said no. Trump blamed the loss on Democrats, calling Pelosi and Schumer “losers.” The conservative WSJ Editorial Board blamed Republicans. NYT reported that a US led coalition is investigating a strike in Mosul which killed up to 200 civilians — the highest toll for an American attack in Iraq since 2003. Unlike Obama who acted in a way to protect civilians, this and Yemen showcase Trump’s complete disregard for human life. 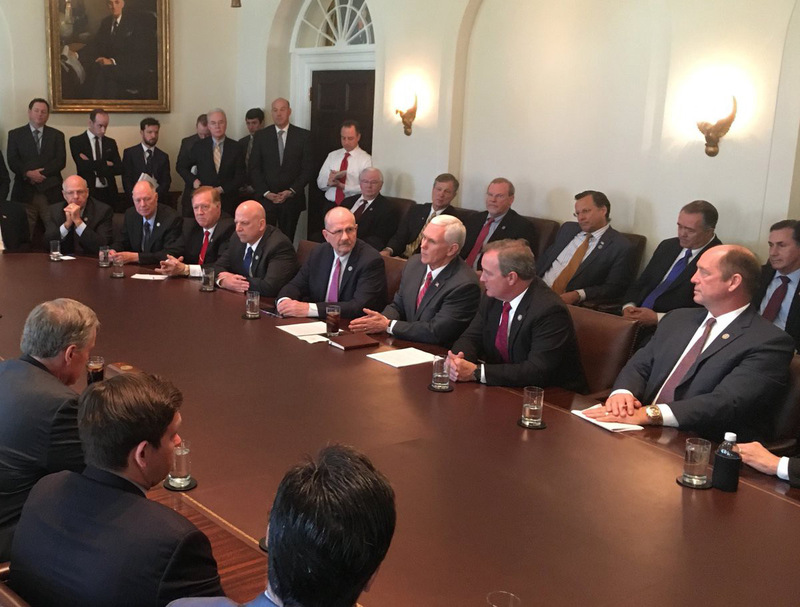 VP Mike Pence tweeted this photo of his meeting with the Freedom Caucus to discuss Trumpcare. Conspicuously absent are women and people of color.